Select Image Comment from the Nikon D5600’s Setup menu, as shown on the left. 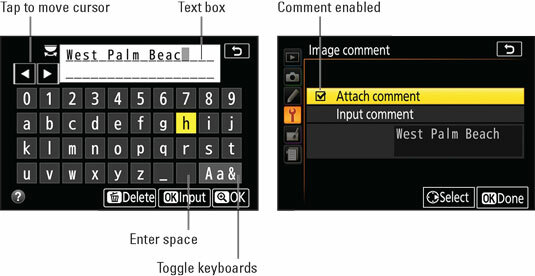 Then select Input Comment, as shown on the right, to display the keyboard screen shown on the left in the second image. You can tag pictures with hidden text comments through this feature. After entering comment text (left), select the Attach Comment box (right) and then press OK or tap Done. Enter a character: If the touch screen is enabled (check the Touch Controls setting on the Setup menu), just tap a character in the keyboard. You also can use the Multi Selector to highlight a character and then tap the OK Input symbol at the bottom of the screen or press the OK button. Either way, the characters appear in the text box, labeled on the left side. Your comment can be up to 36 characters long. To cycle from the keyboard shown in the figure, to screens that contain uppercase characters and symbols, select the Aa& key, which is the last one on the keyboard. Select the empty box just to the left of that key to enter a space. Move the cursor in the text box: Tap the cursor arrows (see figure) or rotate the Command dial. (The symbol just above the arrows represents the Command dial.) For big cursor moves, rotating the Command dial is the fastest option. Delete a letter: Move the cursor under the letter in the text box and then tap the Delete symbol at the bottom of the screen or press the Delete button. After entering your comment, tap the rightmost OK symbol (the one marked with a magnifying glass) or press the Zoom In button to display the screen shown on the right. Your text comment appears underneath the Input Comment line. You’re not done, however: You still need to place a check mark in the Attach Comment box, as shown in the figure. To toggle the check mark on and off, tap the Attach Comment box or press the Multi Selector right. Finally, press the OK button or tap the OK Done symbol to exit to the Setup menu. The Image Comment menu item should now read On, and any new pictures you take will include the comment data. To disable the feature, remove the check mark from the Attach Comment box. Press or tap OK to make your decision official.